At a long table set up in front of the main stage at AFN, Gov. Bill Walker, a state commissioner and representatives of 17 tribal organizations big and small signed an umbrella agreement known as a compact. It provides a framework for tribal authority in an area that has been state government's responsibility. The document inks in a partnership between the state and tribes. It sets general terms including requirements to keep children's cases confidential and the types of duties that can be taken over. 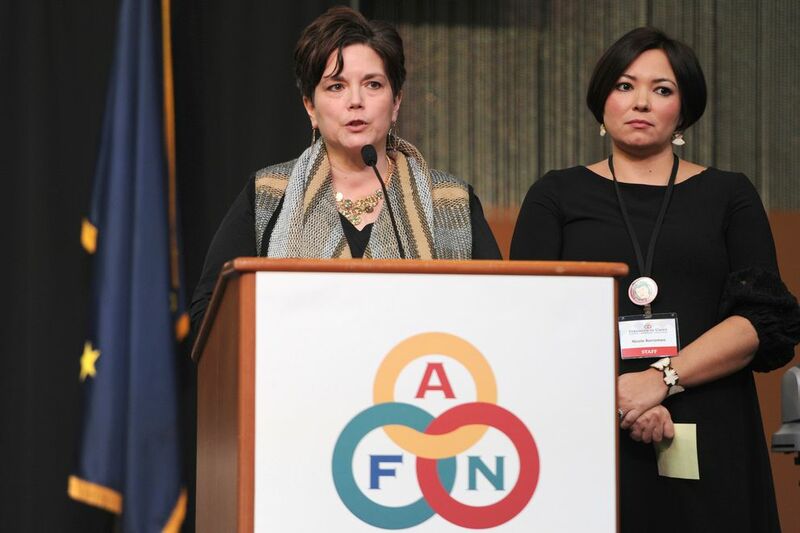 "We are getting recognized for our sovereign ability to take care of ourselves," Peterson said Wednesday at an AFN tribal leaders session, where the effort was presented. It's the first state-tribal compact for child welfare in the country, said Valerie "Nurr'araaluk" Davidson, commissioner of the state Department of Health and Social Services and a member of Bethel's tribe, Orutsararmiut Native Council. About 57 percent of them are Alaska Native, almost triple the proportion of Native children overall in Alaska, Davidson said. 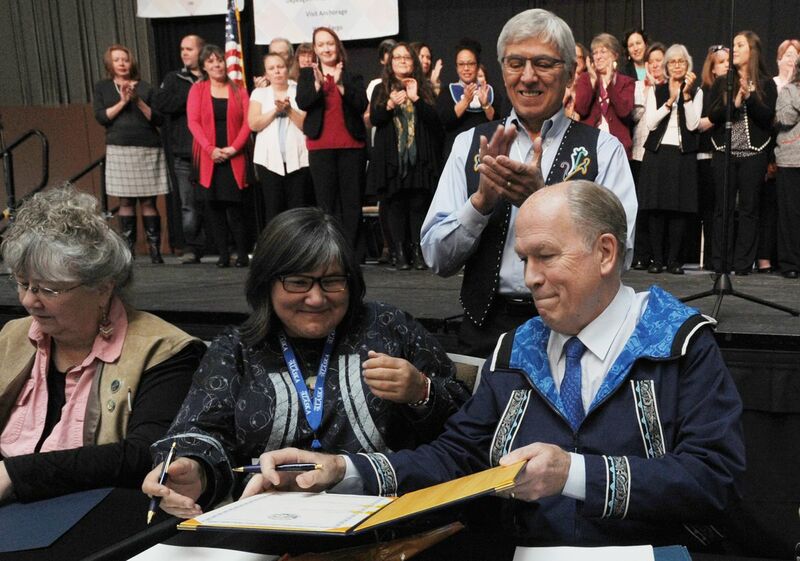 It was Davidson — the former general counsel for the Alaska Native Tribal Health Consortium — who first raised the idea of a compact, like the tribal health agreement signed in 1994. The tribal takeover of health care has made a difference, she said. Patients get better access to care, according to the Alaska Native Tribal Health Consortium. There are more health aides in villages and more access to specialists. More villages have running water. There's emphasis on education such as for diabetes and tobacco. "Children and families have better outcomes, when care is delivered closer to home," Davidson said. "And we know that same opportunity exists in child welfare services." Negotiations between the state and a number of tribes began in April and just wrapped up this month — a seven-month process. And for Davidson, it's something more. "Culmination of life's work, really," she told reporters after the compact was signed. AFN took a direct role. Its general counsel and executive vice president, Nicole Borromeo, helped lead the effort. A group of state officials, tribal leaders and attorneys met repeatedly at AFN's headquarters. Will Mayo, AFN co-chairman and head of tribal government and client services at Tanana Chiefs Conference, led the tribal caucus. Tribes that want to take on child protection duties for the first time will start small. They can work with other tribes that have experience, she said. Tribes don't want to go too fast, but are ready to begin. In the Yukon-Kuskokwim Delta, the Association of Village Council Presidents hopes to focus initially on case management and foster home recruitment, said Liz Pederson, its chief operating officer. While the compact is a group document, individual tribes will negotiate and sign contracts for specific duties. This budget year they can take on the jobs of finding relatives of Native children and supervising visits between parents and children, Lawton said. Tribal organizations also will get a chance to see if they can help the many families reported for abuse or neglect whose cases don't rise to the level that the state investigates, Lawton said. That involves sharing of closely held information, between the state and tribes, and tribes to one another. Many Native families are afraid of the state Office of Children's Services. Children so often are taken away. Families likely will be more receptive to working with other tribal members, Lawton said. And gradually they will be able to do more. Eventually some tribes — if they so desire — will take on most, if not all, the duties, Lawton said: investigations of reports of child abuse and neglect, foster care, working with troubled parents, adoptions. The state likely will be able to save money since the workers will live right in the village, she said. Now they work in hubs and travel by plane and boat. One of the biggest sticking points was whether tribes had to give up their sovereign immunity from lawsuits to do this difficult and sensitive work. The state initially said tribes had to give it up no matter what work they were doing. Their land could be lost in a lawsuit. Tribes were ready to walk away, say those involved. Then the state agreed that there was no need for tribes to waive their immunity for low-risk duties — like searching for a child's relatives. When the two sides finally came to terms on that, people in the AFN conference room clapped. A few shed tears of relief. The convention at the Dena'ina Civic and Convention Center continues through Saturday.